Protein folding is a fundamental function in the mundane operations of a cell’s daily life. 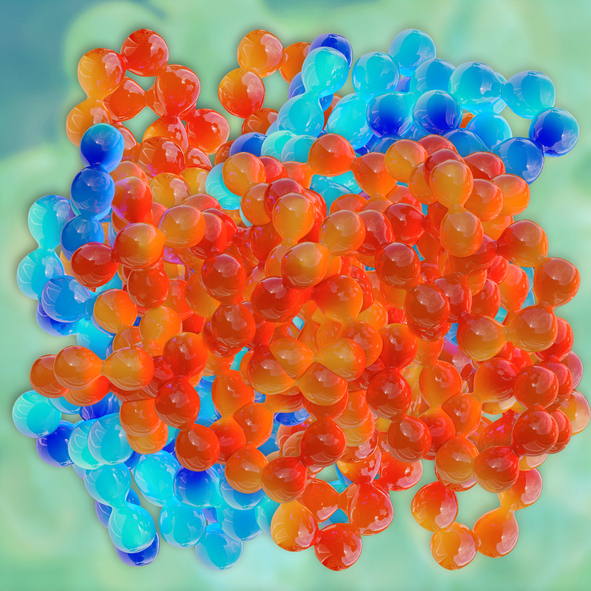 Yet, when this task goes wrong, it becomes readily apparent how vital of a role 3D structure plays for the vast majority of protein molecules. In the past, scientists concluded that the aberrantly assembled proteins were the result of certain metabolic disorders, but new evidence from investigators at the Medical University of South Carolina (MUSC) suggests that the cell's response to unfolded or misfolded proteins could be a cause, rather than a consequence, of metabolic disorders. There are links between protein-folding problems at the cellular level and a range of metabolic disorders, though it is unclear if those problems are causes or manifestations of such disorders. This study provides evidence that problems with protein folding contribute to certain metabolic disorders. When improperly folded molecules are encountered in cells, the unfolded protein response (UPR) is activated within the endoplasmic reticulum (ER). The ER is in charge of molecular quality control, making sure proteins, lipids, and other molecules are folded properly before the cell attempts to use them for metabolic processes. In the current study, the researchers found that the master protein called grp78 is in contact with three main signaling hubs that make up the control center of the UPR. When an unfolded, or misfolded protein is encountered by grp78, it breaks contact with those sensors and activates the UPR. The UPR then refolds or disposes of such molecules before they are shipped to the parts of the cell that need them. When too many unfolded proteins build up, the UPR senses that the cell has become overstressed and activates programs to recycle the cell. Yet if some cells experience such stress and are similarly retired, whole organs can suffer. This appears to be where the CNPY2 molecule exerts influence during the development of metabolic problems. CNPY2 has been known for some time to reside within the ER, but its function there has remained a mystery. To start, mice without CNPY2 were generated to see how they would grow. Although the rodents were slightly smaller, they were otherwise normal. Significant differences appeared, however, when they were fed tiny amounts of tunicamycin, a known inducer of the UPR. Control mice exhibited signs of liver stress and activation of PERK, one of the three main UPR sensors, while the livers of knockout mice remained stress-free. This was the first sign that CNPY2 could be involved in metabolic stress in the liver. To test this idea more directly, the researchers fed mice a high-fat diet for several weeks. Those that lacked CNPY2 were again protected, this time from the development of hepatic steatosis, an early sign of nonalcoholic fatty liver disease (NAFLD) that develops in people who consume a diet high in fat. Next, the researchers looked at the molecular basis of these observations. If their hypothesis was correct, they would confirm that CNPY2 was required for the development of liver problems as a result of a high-fat diet. At the molecular level, this would mean that CNPY2 interacts directly with one of the UPR sensors, which the researchers suggested would be PERK. The investigators examined mouse cells with and without CNPY2 and isolated the PERK protein and its downstream signaling molecule, CHOP, within them. This interestingly named PERK-CHOP pathway, which is a major enabler of liver stress when the UPR is induced, was not activated in cells without CNPY2. When they added CNPY2 back to those cells, suddenly the pathway was restored. Protein isolation experiments confirmed their hypothesis that CNPY2 and PERK interacted closely when the UPR was again induced by the drug tunicamycin. Additionally, the master protein grp78 that regulates all three main UPR sensors interacted with CNPY2 under normal conditions. But when the UPR drug was added, grp78 left CNPY2 able to interact closely with PERK, which finally activated the PERK-CHOP pathway. Last, they found that the PERK-CHOP pathway, when activated by free CNPY2, further increased levels of CNPY2 in the liver. In other words, CNPY2 was able to reinforce itself further once activated. “This novel finding has raised the possibility of developing new treatments for metabolic diseases by targeting CNPY2,” Dr. Hong concluded.